With the air of this 'energy void' throughout, the world of this absurd black comedy, based upon the theatre play of the same name, starts to take over the world. With Crazy Thunder Road (1980), Burst City (1982), The Crazy Family (1984), Angel Dust (1994), Electric Dragon 80,000V (2001) and more, Gakuryu Ishii (previously known as Sogo Ishii) has been wittily overstepping genre boundaries with striking images and music. 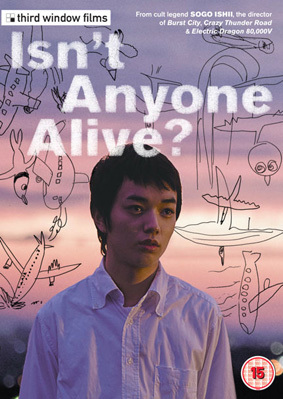 In his latest feature film he has adapted the Shiro Maeda play Isn't Anyone Alive, an avant-garde story of 18 young students dying one after another. Isn't Anyone Alive? (Ikiterumono wa inainoka) will be released on UK DVD on 22nd October 2012 by Third Window Films at the RRP of £14.99.